A depiction of the conjunction of the moon and Venus on July 15, 2018, as seen from the East Coast of the U.S.
Venus is due for a date with the moon tonight, July 15, with the two bodies appearing to dance within half an inch of each other in the western sky, depending on your location. The conjunction is Venus' second celestial appointment this week, after it met up with the star Regulus on Monday night. For U.S. viewers, Venus and the moon will look closest together from the West Coast, appearing about four times farther apart for skywatchers on the East Coast. Wherever you're located, be sure to head outside early in the evening, because both bodies will set at around 10 p.m. local time. 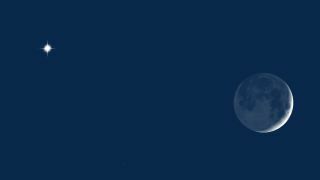 Tonight, the moon will be only about 12 percent illuminated, because a few days have passed since the new moon appeared. But the dark part of the moon should show earthshine, a faint glow caused by light reflecting off the planet. Editor's note: If you capture an amazing image of Venus with the moon and would like to share it with Space.com for a story or gallery, send images and comments in to: spacephotos@space.com.